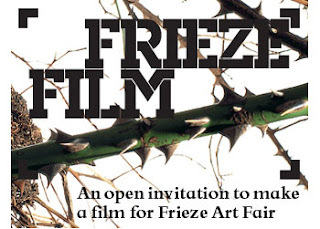 Frieze Film 2008 announces Road Movie, an experiment in film making, authorship and dispersal made in response to the way in which digital platforms such as YouTube have made film a medium freely available to all. Road Movie will be a film made by artists and filmmakers in response to an open invitation issued by Frieze Film. Road Movie will be produced and distributed on the Frieze Film 2008 group on YouTube at http://www.youtube.com/group/friezefilm2008 , and on the Frieze Film website http://www.frieze.com/film . The final result will be a film made in an entirely new way: the first multi-authored fractal film assembled from the sum of its submitted parts. Inspired by Cormac McCarthy’s 2006 novel ‘The Road’, Frieze Film will not have a conventional narrative: in addition to submitting original material visitors to YouTube will be able to download and refashion existent clips, spurring a chain-reaction of multiple narratives and occurrences: Road Movie will be wholly individual and collective. Frieze Film will be shown in Channel 4’s admired ‘3 Minute Wonder’ slot during the week of Frieze Art Fair from Monday 13 October to Thursday 16 October at 7.55pm. Digitised content is easy to share and copy. That is exactly what people do with it: often illegally and often free. There is no turning back. Internationally celebrated artist Yoko Ono will present a major installation of her participatory work, Wish Trees, in the large central courtyard at One Colorado from August 2 through November 9, 2008. The installation will consist of a number of living trees selected by the artist, and which are identified with the environment or history of Southern California. Visitors are invited to write their wishes on pieces of paper and hang them on the tree branches. Public access to Ono's art installation and the One Colorado Courtyard is free. Wishes from Pasadena will be joined with wishes from all over the world and placed in specially constructed capsules to be buried in the area surrounding Yoko Ono's public art project in memory of John Lennon, the Imagine Peace Tower on Videy Island, off the coast of Reykjavik, Iceland. The tower, a column of light emanating from a base with a radius of about 10 meters (approx 33 ft.), is lit for two months each year starting on October 9, John Lennon's birthday, and ending on December 9, the anniversary of his death. Yoko Ono's influence for this piece is connected to her early childhood experiences in Japan: "As a child, I used to go to a temple and buy a printed paper wish sold at the temple and tie it around the branch of a bush. Bushes in temple courtyards were always filled with people's wish knots, which looked like white flowers blossoming from afar," she said. The act of wishing is described by Ono as a "collective prayer." Some wishes are deeply personal, some represent wishes for all humankind.